The first Adventure Island was nothing more than a copy of Wonder Boy with some redone graphics. 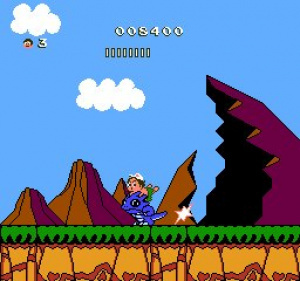 While Wonder Boy quickly became more of an Action RPG series, Adventure Island stuck to the platformer formula for a while before eventually following the same path. The general mechanics are still the same. Higgins' girlfriend has been kidnapped by the evil Witch Doctor, so he's got to fight his way across eight different islands to rescue her, each divided up into several stages. You still run from left to right, grabbing fruit to keep your energy up and the occasional skateboard to make you go faster (at the cost of not being able to stop) or fairy to make you temporarily invincible. To give Higgins a bit more power, he now has the ability to find dinosaurs, which he can hop on to give him an extra hit point, as well as a different attack. By default he only throws his trademark arcing axes, which usually get the job done but aren't very strong, so it's wise to try and stick to dinosaurs as much as possible. Should you get hit while on one, it's not like Super Mario World where Yoshi will run around allowing you to jump back on him — the dinosaur will instantly disappear. However, if you find a different dinosaur while already riding one, you'll hop on to the new one and the old one will be added to your "reserve" supply. Before each level, you can see your amount of "reserve" dinosaurs and axes; if you ever come across a tough level, you can use your reserves to instantly start the level with a weapon or a dinosaur. Of course, it's wise to try and conserve them as much as possible, as you're probably going to need them towards the end. 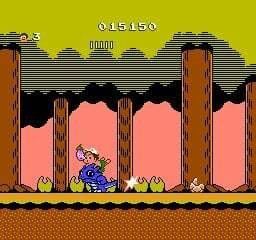 As in most Adventure Island games, there are a few secrets to find in certain levels, which can get you anything from a free dinosaur to a warp to the next island. If you just keep attacking as you're running along, you'll eventually hit something seemingly invisible; go to its location and jump there to find a secret egg with your reward. 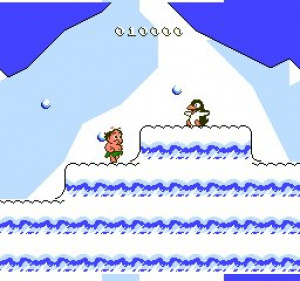 A frequent complaint about Wonder Boy and Adventure Island was that the protagonist was very annoying to control and would generally slip and slide all over the place. This has been resolved somewhat in this sequel, but it's still not entirely perfect and can cost you many lives if you're not careful. Thankfully, boss fights, unlike the first game, do not all look near identical and use the exact same attack. The ones here actually look and act completely different, so you can't just use the same strategy over and over. One good thing Adventure Island always had going for it was its length, which stays true here. Except for one island, they're all quite long, having about seven or eight levels each. The levels aren't particularly long, either, so frustrating situations where you die at the end of a very long stage are unlikely to happen. 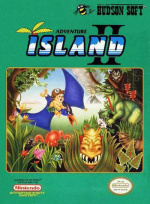 Although the graphics of the first Adventure Island are pretty iconic, none of its sequels looked at all like it; those on the NES all went for an even more cartoony, cleaner look, which looks quite decent. It wasn't too hard to improve on the music, as the original only featured a handful of songs that were all played to death. There's a few more different pieces here and they're not nearly as pronounced, so as not to potentially drive you insane. Adventure Island II is quite similar to its predecessor in many ways, but with its slightly better control and handful of gameplay additions, it's just that little bit more entertaining. It's also a lot more accessible due to the reserve item system and the shorter stages, compared to the rather brutal original game. Looks good, but not really my style. 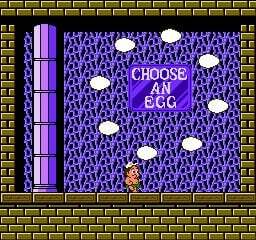 Oh how I love these NES Adventure Island games. Great review Drake! This was the first Adventure Island game I ever played. I remember renting this one from a Ma and Pa video store when I was a kid. I loved how you got dinosaurs to ride on I thought that was the best part of the game. poor dino is getting it from behind. I miss these old NES SideScrollers! Adventure Island 2 and Mega Man 5, how how I wan't thee. Anyways, so how much easier is this compared to the original? I hope it's not 'that' much easier, but at the same time there were a few levels in the original that were brain sizziling difficult. 8-2 is the devil! I doubt anything in AI II will even touch that. pick an egg! what perverted game is this! "The first Adventure Island was nothing more than a copy of Wonder Boy with some redone graphics." I still don't get it. Every time I've tried to play a game in this series, it feels like a master class in uninspired level design. I suspect a random generation of enemies and obstacles might actually turn out better. I downloaded it and love it! I really gave me a nostalgia rush, since I did rent it in the past at my local movie rent-shop (back in the day when they had games for hire). It looks better then the first one and I love the dinosaurs. The levels are shorter though, but the difficulty ramps up quickly so it's not a big problem. What's strange though is that the way you play determines wich road you take. If you are quicker/more succesful you take a totally different road to one of the bosses. And if you fail at the boss, the boss goes to another place. You first have to finish the level and then you can go to the level where the boss went to. I wonder if I have played the third one or not. Anyway, I download it when it gets available on vc! This is AI game I liked the most growing up. Gonna have to empty the ash tray of loose change. What year was this originally released? I can always remember exact moments in my childhood based on the games I played at the time. I remember renting this for my birthday and we all pretty muched sucked at it back then. It would be fun to give it another go. Best Hudson soft ever made together with Bomberman. When is this coming to North America? I needs it! Whoever decided not to bring this to North America must be trying to troll Americans. This game is a big improvement over the first one, and it is worth playing. The only way it would be not worth buying is if it was more than 1000 Wii points. I love this game. I used to go out to rent this game. Couldn't get enough playing it. Good memories.